(1), Sacrifice a creature: You gain 2 life. Off the top of my head, the loops I can think of requires at least 4 cards. Gutless Ghoul as a sacrifice outlet and to sink the generated. Puppeteer Clique for its Persist ability and to recur a utility creature from opponent's graveyard. Lastly something to counter the - 1/-1 effect from Persist. Several comes to mind Sage of Fables , Metallic Mimic , Rhythm of the Wild , etc. This loop will grant you Infinite life. Other interactions depends on the creatures in your opponents ' graveyard. I'll come back when I've more eureka moments. Cheers. Gutless Ghoul can be better then Sangrophage. Deathgreeter can be help to gain life, instead of the artifact. Hi 5finga, thanks for your many suggestions. I don't really like Voracious Null nor Gutless Ghoul because their active abilities have an additional mana cost (even though that cost is perfectly balanced in the case of Gutless Ghoul). I also never understood the popularity of Twisted Abomination (paying 6 for a 5/3?? , ok it can regen, but... Maybe only if cycled and then Exhumed). Similar thought for Gavony Unhallowed, it costs too much and for this reason Carrion Feeder is better. Cemetery Recruitment is good, but it would be perfect for a , with its 2 drop cost is replaced by the better Ghoulcaller's Chant. Also, it couldn't combo with Nameless Inversion, because it explicitly says "creature card" and not only "zombie card" as the Chant does. On the other hand, Wight of Precinct Six may be perfect, I don't know how I missed it! Thank a lot for this last piece of advice! I know it's a long answer but I wanted to write down all my thoughts about these cards. 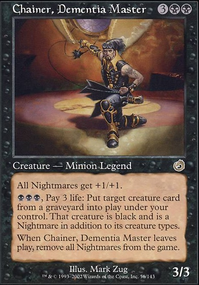 That would actually go good into the deck, however I think that I would like to keep Nameless Inversion, as I can get it back because its a changeling, thus its a zombie card by technicality. but bringing it up does make me think, I already have lifegain via Gnawing Zombie and may want to opt to Remove the Gutless Ghoul and in the sideboard for the 2xTragic Slip in order to put in 2x Dash Hopes into the mainboard. 5 damage to an opponent and the possibility of stopping them late game AND being able to get back a spell that pumps my creatures by +3/+3 might be a good idea to include both. Nice deck, love the name. I do have some suggestions, all of them of common rarity. Tragic Slip and Bone Splinters are great removal, and they both can eliminate threats for a cheap mana cost, while still sacrificing creatures. Gutless Ghoul works great with cards like Doomed Dissenter, since it allows the death trigger to activate while allowing you to gain some life. 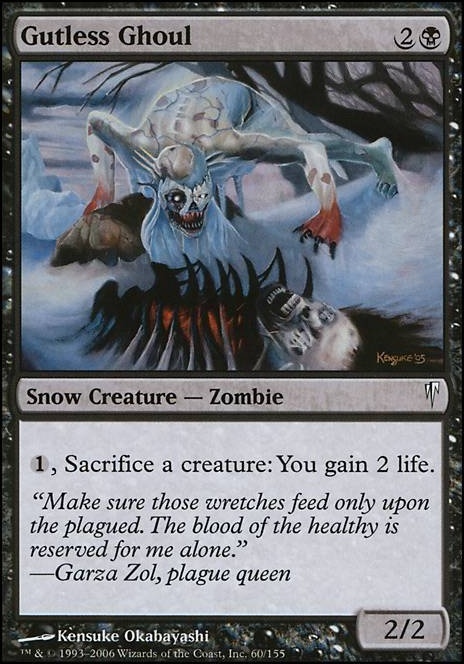 Culling the Weak might be a good replacement for Dark Ritual, as it allows you to gain more mana while sacrificing a creature. Love the deck, +1. After some play testing, I removed Aetherflux Reservoir & Gutless Ghoul because they felt slightly off theme, and too much of a closed combo. In their place I added Temporal Extortion, Slaughter Pact. 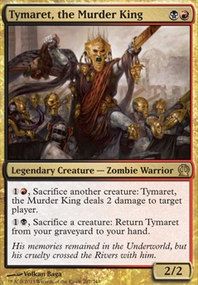 As well as putting Spawning Pit back in for more free sac outlets, as well as instant speed blockers, and Thief of Blood makes its way to back into the main board as an alternate win condition.